“Are you a victim of an inadvertent ‘Reply to All’ gaffe? Don’t worry, you’re not alone. Every day, thousands of people unwittingly share their most intimate thoughts with complete strangers. And it’s all thanks to that pesky ‘Reply to All’ button in Microsoft Outlook. Read on for a pretty novel trick to save you a little embarrassment. Posted by brad at 2:03 pm on April 15th, 2008. The Identify phase of our IMS workflow takes place first thing in the morning and is your opportunity to size up the day before diving headlong into your email. It’s the time for you to make sure that you have your priorities in line so that you don’t lose sight of the day’s goals. You ensure that no matter the number of fires you come across during the day, you knocked an important task off the list. You devote the time that is needed to address the task. If you put off your most important task until after you have gone through email, you may find that you haven’t left enough time to give it the proper attention it needs. On the softer side, a rewarding sense of satisfaction permeates the day when you’ve taken one of your more important tasks out so early. Try it, you’ll like it. Posted by brad at 5:23 pm on April 14th, 2008. One of the features that I use literally hundreds of times a day is Original Message filing. It has become such a critical part of my workflow that I find it maddening when I try to process mail without it. As you reply to a message or create an appointment or task from the message, set Original Message to File To Topic. As you save the new item, IMS will automatically file the original message to it’s associated Topic folder. This saves an extra step when processing mail to clear the Inbox. For more detail on this and other advanced Task and Calendar management features, see our video tutorial. Posted by brad at 4:22 pm on April 7th, 2008. In this age of broadband proliferation where more and more software companies stop pressing physical media, it’s surprising to find a photo-shopped picture of a software box at every software site I visit. It’s silly really; an outdated convention that software developers need to display a retail ready picture of their product to add a sense of physical legitimacy in an otherwise digital world. Posted by brad at 9:44 am on April 4th, 2008. The second edition of Michael Linenberger’s #1 best-selling Outlook book, Total Workday Control Using Microsoft Outlook, has been released today. See the announcement here. In conjunction with the new book, we have released a new TWC-powered version of ClearContext. Details below. "…it is a system to successfully manage the overload of work that you have on your plate right now. It truly does help you manage that period of time you tend to be most anxious about: your now. It helps you choose what tasks to do now, what e-mail to focus on now, what not to worry about now. You gain confidence that the important tasks are attended to, which greatly lowers any anxiety you might have about your workday." I had the pleasure of reviewing the book before it was published and found that the MYN system perfectly articulates the way that I have managed my tasks for years; providing focus on the things that must be completed in the next week or so and pushing everything else outside the "Now Horizon." MYN puts process behind this concept to ensure that you stay focused on your immediate tasks without dropping the ball on anything coming over the horizon. For a more thorough look at the theory, see this sample chapter from the book. 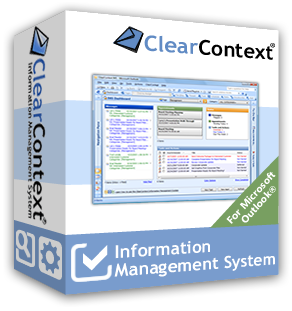 In conjunction with Michael Linenberger, ClearContext has developed an MYN-powered version of ClearContext IMS. The new release comes pre-configured to support the MYN system and includes 14 new custom Outlook views, a customized TWC toolbar, tighter integration of TWC teachings in the product, and much more. See our TWC partner page for more detail. If you have questions about the new product, ask about them in our forums. We are very excited about the release of Michael’s new book and our software to support it. If you are looking for a comprehensive, end-to-end task management methodology, check out the new Manage-Your-Now system and MYN-IMS v4. Posted by brad at 10:57 am on April 2nd, 2008. Which ClearContext Inbox View Is Right For You? By default, ClearContext opens Outlook with a date-ordered, color-coded view. Much like the default Messages view in Outlook, this shows messages in the order that they are received; adding email priority color-coding and Topics for better message management. Did you know that there are a lot of additional options for IMS Inbox viewing? In addition to the default view, ClearContext can display email in priority order and provide gmail-like threading of messages. I encourage you to go to ClearContext > Inbox Views > View Selection Wizard and find a view that works for you. For more information on ClearContext views and view management, including customizing view colors, see our User Guide. Posted by brad at 9:46 am on April 1st, 2008.